Imagine a mini redwood forest you can walk into and spend a while even though its part of someone’s private SF property. Or a refreshingly lush rooftop garden. They’re called Privately Owned Public Open Spaces and there are over 60 of these scattered around the city. Also known as POPOS, these areas have been part of the city’s development requirements since the 1985 Downtown Plan passed, and are often part of major commercial development projects. Some of the owners don’t want you to know these oases are there for the public, but they are there and they’re supposed to be maintained for public visits, often with comfortable seating, fountains, excellent landscaping and gardening, and sculptures. As with public parks there can be specified hours the POPOS are open. 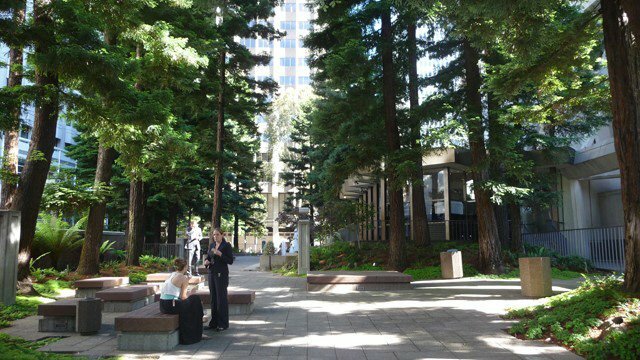 The very best POPOS include the aforementioned redwood park in the Transamerica Pyramid building property, a lovely plaza at 525 Market, several spacious, well landscaped roof terraces, and an indoor park on Second Street.